This is Johnny the Horse, an inmate of the Lunatic Asylum on Blackwell’s Island who’d been there since he was a young boy and who believed himself a horse. 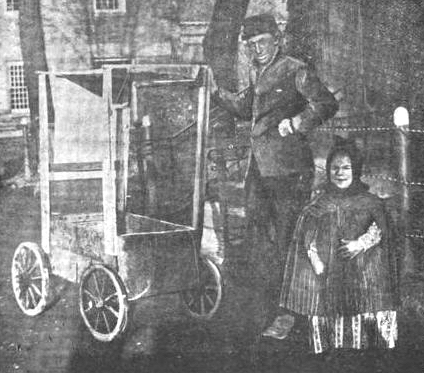 With an unraveled rope functioning as a tail, he’d paw the ground like a horse, and deliver packages around the Island while hitched to a crude wooden soapbox style cart pictured here. Johnny never wanted to leave Blackwell’s, where he slept in a stable at night, and when he was told he was being transferred to Ward’s Island in 1895 he was distraught. Sadly, he was later transferred to the Asylum for the Insane on Ward’s Island and after that to the Central Islip State Hospital. I could find no record of him after that, but presumably he died there. I’m so glad your book introduced us to the Rev. French. How kind to write a letter and try to keep Johnny the Horse in the only home he had ever known. So sad to think of him still having to leave. I hope his celebratory run(s) around the island indicate that he did have some joy in his life! Someone suggested I create a wikipedia page for Rev. French so I’ve started working on that. But I hope to find someone who has done this before who can walk me through it, to save some time.